A groundbreaking ceremony was held at Congregation Tifereth Israel, 109-18 54th Avenue in Corona, at 11 am June 22. The landmark 1911 wooden building is a rare survivor of the earliest, vernacular synagogues built in Queens and is the oldest synagogue in the borough, celebrating its 100th anniversary this year. Click here to see photos on the Landmarks Conservancy Facebook page. Restoration will remove the present stucco coating and restore the original wood clapboard siding, wood windows and doors, Moorish-style metal domes and finials, and historic paint colors to this important building, returning it to its appearance of a century ago. The New York Landmarks Conservancy has worked with the synagogue for more than a decade providing $30,000 in direct grants and serving as the project manager. 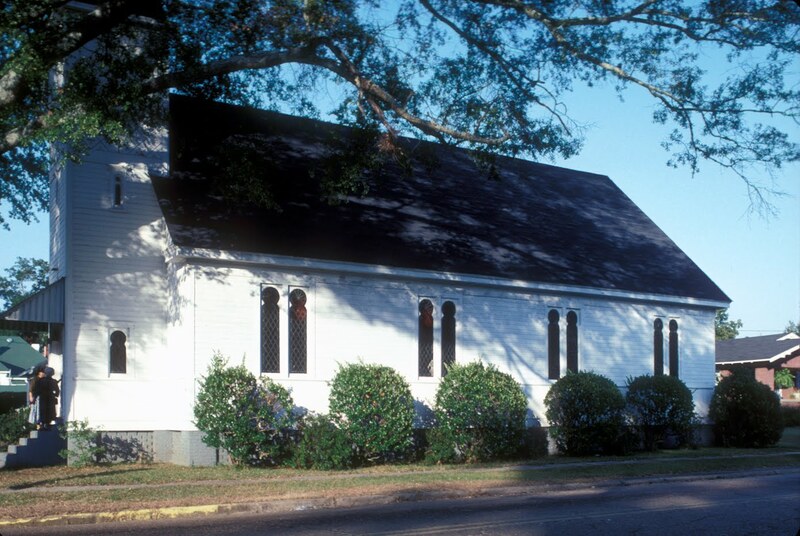 The Conservancy helped the congregation with their selection of preservation architects Li/Saltzman; liaison with City and State funding agencies; selection of construction contractors Lipsky Enterprises, Inc. and LoDuca Associates, Inc.; and will now help the congregation manage and monitor the restoration work. The synagogue, which has been revitalized in recent years by Bukharan Jwish immigrants, is being restored with $1.1 million in New York City capital funding allocated by Queens Borough President Helen Marshall, augmented by a $200,000 restoration grant from the New York State Environmental Protection Fund. “Its refurbished exterior and doors will now open to a new generation that will cherish it for many years to come,” she said. 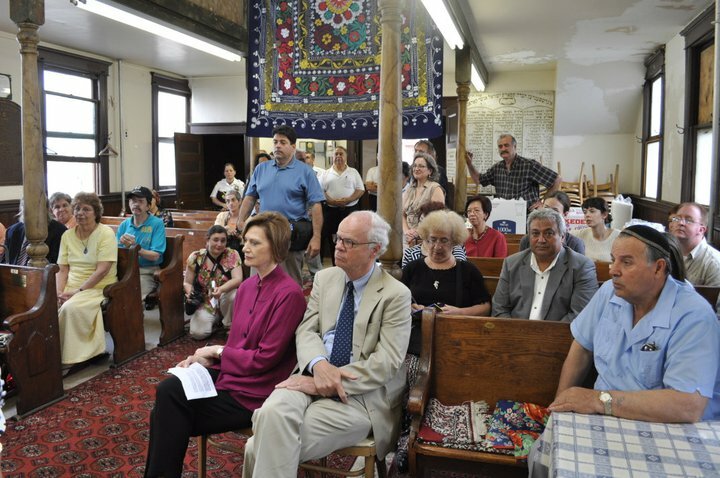 “This synagogue is an important piece of Queens history. We are grateful to the borough president and the other donors who recognize its significance and are helping with its revitalization and restoration,” said Peg Breen, president of The New York Landmarks Conservancy. Pro bono legal services for the project have been provided by the firm of Bryan Cave LLP. Cologne, Germany. 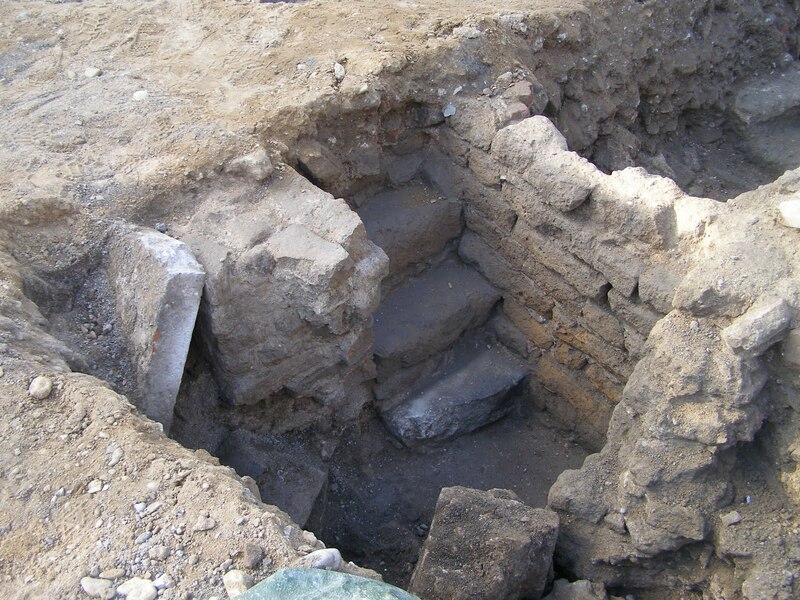 Detail from early phase of synagogue excavation. Photo: Samuel Gruber (2007). Cologne, Germany. 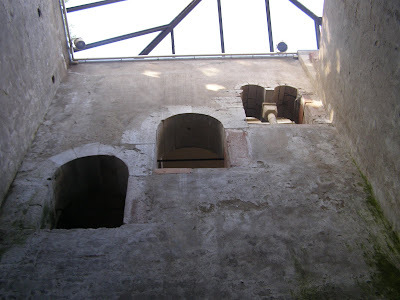 Medieval mikveh, looking up towards superstructure. Photo: Samuel Gruber (2007). I am very excited to be attending next weeks colloquium in Cologne, Germany, where the results of the recent and extensive excavations of the town hall square will be presented and discussed in detail. I first visited the excavation of the medieval synagogue in 2007 and most recently reported on the remarkable finds from this dig earlier this spring. I am thankful to the City of Cologne for inviting me to attend and participate. Together with the recent excavations in Lorca, Spain, the Cologne excavation is probably the more important work of "Jewish archaeology" of the past decade. 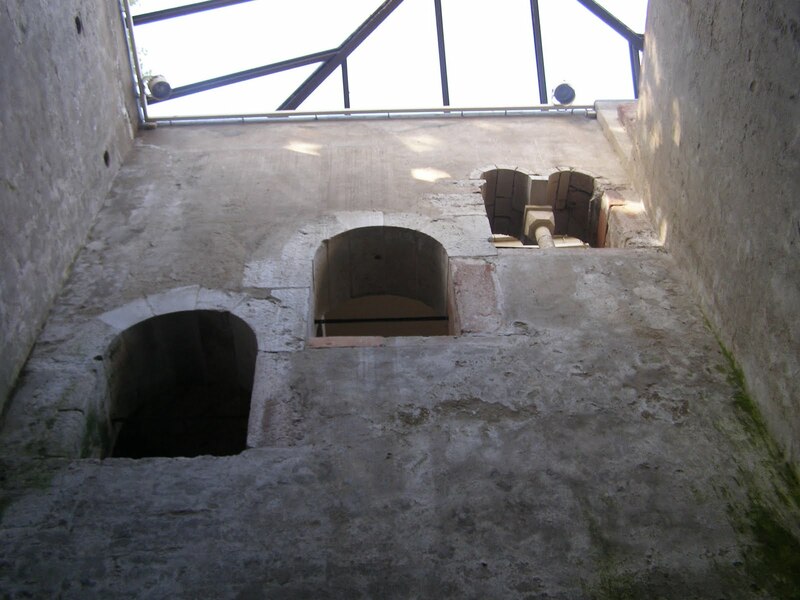 Even though the site had been partially excavated in the 1950s, the finds really present an entirely new picture of Jewish history and community in Cologne. I plan on writing some detailed articles from this meeting after the work is fully presented. In the meantime, here is the working schedule of the event. Simultaneous translation in ENGLISH available for the whole congress! Ernst Baltrusch, Constantine The Great and the Rescript of 321. Antijewish Predjudice or Religious Tolerance? 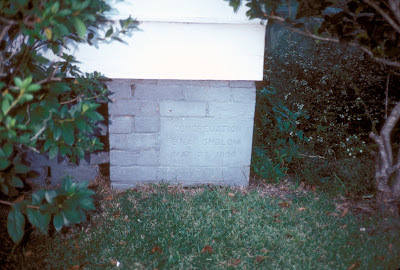 (ISJM) Twenty years ago I had the pleasure of visiting the small but lovely Temple B'nai Sholom in Brookhaven, Mississippi. Even then there were few Jews left in the town to use the synagogue, built in 1896. Still, it was well maintained, and could still serve the community on holidays. But even in 1991 it was clear something would have to be done to save this building and its history for another generation. 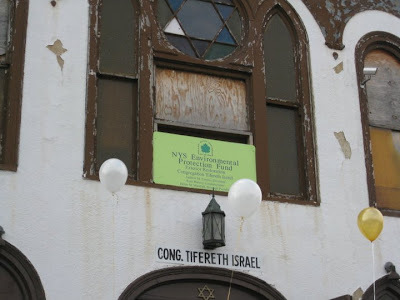 I wrote about the building on this blog in June 2009, and shortly afterward the synagogue was deconsecrated. With just two Jews in town, B'nai Sholom was too much to care for. But the tiny congregation had planned ahead and when the doors closed for worship it was announced that the building was begin donated to the Lincoln County Historical and Genealogical Society to be used as a county history museum, which would include a B'nai Sholom Jewish heritage exhibit, organized by the Institute of Southern Jewish Life. The new museum and exhibition opened March 11, 2011. According to an article by Rachel Jarman in the current issue (summer 2011) Circa: The Newsletter of the Golring/Woldenberg Institute of Southern Jewish Life , "On the bimah, panels describe the orioginal use of the Temple and explain the various Judaic items still in the sanctuary including the ner tamid, Ten Commandments and menorahs." The exhibit also empahsizes the role Jews played in the town's history. jews came to Brookhaven in the mid-18th century and played an important role in the commerical life of the town. Three Jews have served as mayor of Brookhaven. For more information about the synagogue and the museum contact Rachal Jarman at (601) 362-6357. The situation in Brookhaven is not unique. In June 2007 I wrote about the synagogue of Stevens Point, Wisconsin and it restoration as a local history museum. You can read about it here. Washington, DC. Program for 1876 dedication of Adas Israel. Photo courtesy of the Jewish Historical Society of Greater Washington. Washington, DC. Former Adas Israel today . Photo courtesy Julian Preisler. On a few previous occasions I have mentioned visits of heads of state to synagogues. One of the most significant such occasions in American history was the visit 135 years ago of President Ulysses S. Grant to the dedication of the new synagogue in the national capital city of Washington, DC. 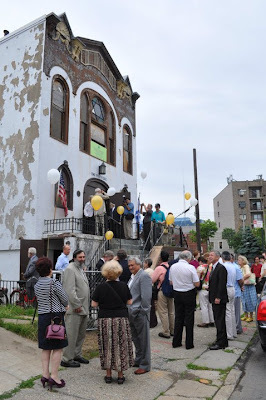 On June 9, 1876, shortly before the nation's centennial, Adas Israel Congregation dedicated its modest building made festive for the occasion with flowers, "festoons of evergreens," and American flags over the Ark. 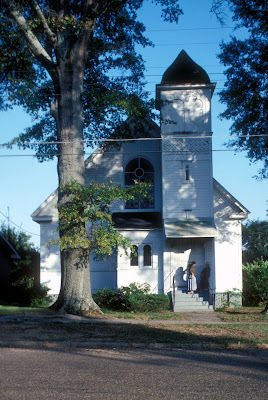 Adas Israel was established as an traditional (orthodox) congregation in 1869. The synagogue was built at the corner of 6th and G Streets, NW, then part of the city's residential and commercial center, after many years of planning and fundraising. The Jewish Historical Society of Greater Washington, now maintains the former synagogue, which was moved to a different site in 1969, as a museum. Washington, DC. Adas Israel on the move in December, 1969. Photo by Jim McNamara, from The Washington Post. I have a special interest in this synagogue and its survival. It was one of the first historic American synagogues - and restoration projects - of which I learned when I first began work as historic preservationist more than 20 years ago. I later had the privilege of contributing to the Historic Structures Report prepared about the building's history, architecture and condition. 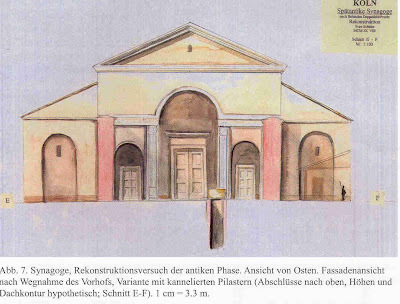 You can read more about the synagogue here, and follow links for pictures and even more information. Grant was the first U.S. president to attend synagogue services in the United States. 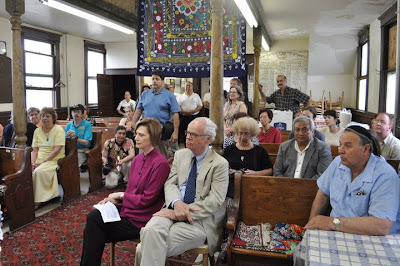 He sat at the front of the sanctuary on a sofa rented especially for the occasion and even donated $10 to the synagogue's building fund, the equivalent of $200 today. The room was filled to capacity and latecomers were turned away. Nowadays such an appearance - almost anywhere in the world - would not seem unusual. I reported last October about the president of Germany attending the dedication of the new synagogue in Mainz. Grant's participation in the events, however, was unusual, and more than a symbolic courtesy. It marked his reconciliation with the Jewish community and return to the principles of his predecessor George Washington, expressed in his famous lines penned to Moses Seixas of Newport, Rhode Island in 1790, that "All possess alike liberty of conscience and immunities of citizenship. It is now no more that toleration is spoken of, as if it was by the indulgence of one class of people, that another enjoyed the exercise of their inherent natural rights. For happily the Government of the United States, which gives to bigotry no sanction, to persecution no assistance requires only that they who live under its protection should demean themselves as good citizens, in giving it on all occasions their effectual support." During the Civil War, Grant had issued General Orders No. 11, violating Washington's sentiment and American tradition, and expelling Jews "as a class" from the areas under his command. Grant subsequently faced charges of anti-Semitism throughout his career. The three-hour dedication ceremony was covered in several local and national newspapers, including The National Republican, The Jewish Messenger, and the Washington Chronicle. The articles which can be read by clicking the links above provided by the JHSGW, describe the decorations, prayers, and sermon given by visiting Rabbi George Jacobs of Philadelphia's Congregation Beth El Emeth. Reading these contemporary accounts, especially those from the non-Jewish press opens a window in 19th-century American perceptions - and openness - to Judaism and American religious pluralism. Riga, Latvia. 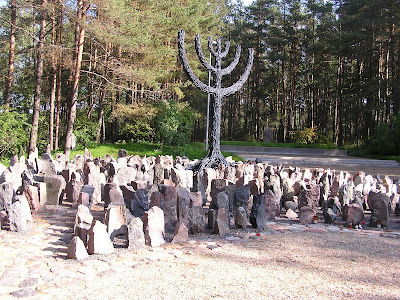 Memorial at Rumbula, the site of the massacre of tens of thousands of Latvian Jews. Photos: Samuel Gruber. 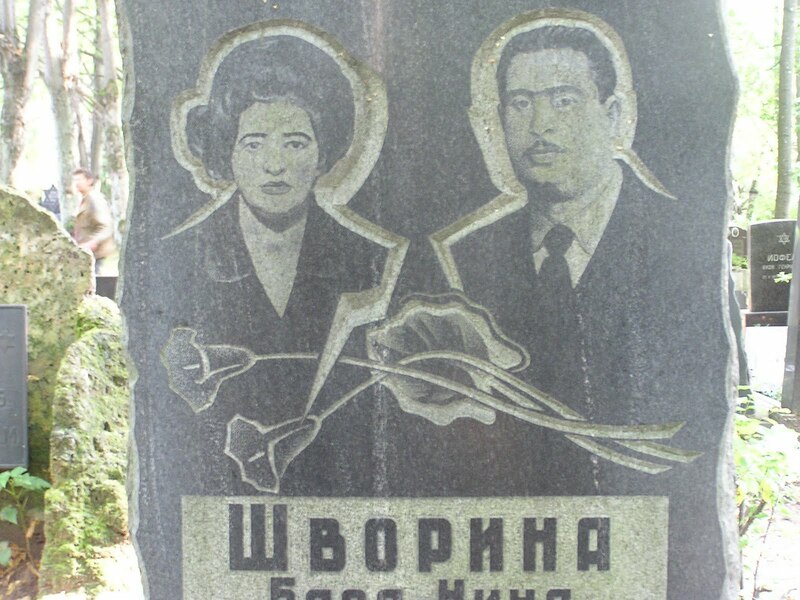 Lo Tishkach has published its latest report about Jewish cemeteries in Europe. 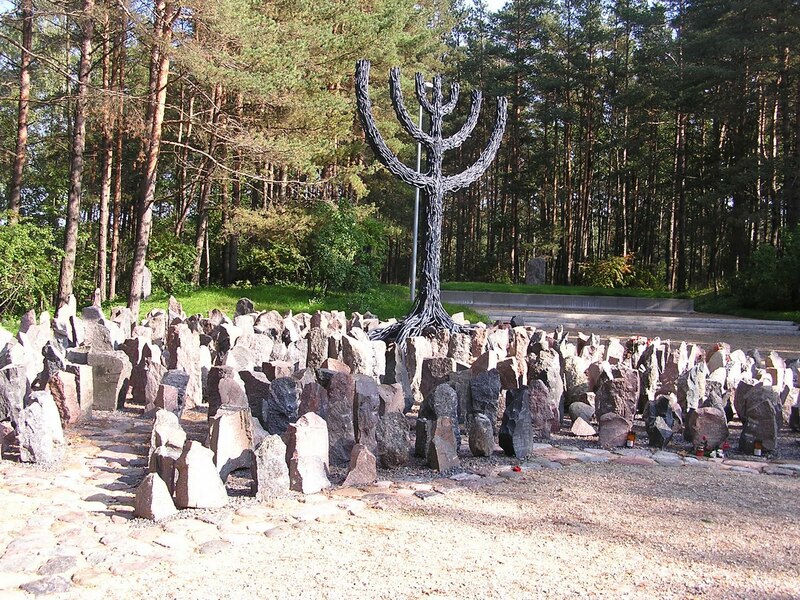 This report presents information about the location and condition of the Jewish cemeteries and Holocaust-era mass graves in the northern Latvian region of Vidzeme, including Latvia's capital Riga. The report outlines the current situation and location of eleven Jewish cemeteries and 28 mass grave sites. Truth by told, because these sites are near Riga, they are among the better documented and protected sites in the country. Still, they also represent some of the most important places, including many sites of mass murder. Phil Carmel, director of Lo Tishkach writes: "Set up in 2006, the Lo Tishkach Foundation European Jewish Cemeteries and Holocaust Mass Graves Initiative aims to collate all known data on Europe’s Jewish cemeteries and mass graves, and to incorporate this vast source of information in an online database so that it is readily and easily accessible to everyone. This database now stands at close to 11,000 individual records of cemeteries and mass graves and when complete may well contain details on close to 20,000 sites. Much of the core information for this project was gathered from multiple sources but our records cannot be truly accurate and up-to-date without details of the situation on the ground...During the summer months of 2010, thirty-nine burial grounds in Vidzeme were located, visited, surveyed and photographed, creating a unique record of the region’s Jewish heritage. Moreover, the surveys took place within the context of broad educational seminars for local youth and students in Latvia, building skills in leadership and volunteerism and raising awareness of Jewish history, heritage and identity." The report builds on a decade of earlier documentation work of researcher Meyer Meler which resulted in the publication Jewish Cemeteries in Latvia published in 2006 [ISBN 9984-19-904-5]. That work was sponsored by the Latvian Council of Jewish Communities, the Museum "Jews in Latvia," and the United States Commission for the Preservation of America's Heritage Abroad. The new report finds four cemeteries need in proper demarcation and maintenance, two other sites to be partially demarcated and protected, with a final fives sites lacking any appropriate form of identification and demarcation. Regarding mass grave sites, only four of them lack identification, and three sites require memorial markers that make mention of the Jewish victims buried there. The remaining 21 sites are appropriately marked. The report is the second to be published of Latvian regions by Lo Tishkach and follows extensive surveys, local interviews and additional research undertaken by local students over the summer of 2010. A report covering Latvia’s Zemgale region was published last year where eighth cemeteries and three mass grave sites were identified as needing proper demarcation and signage, as well as removal of excess vegetation. 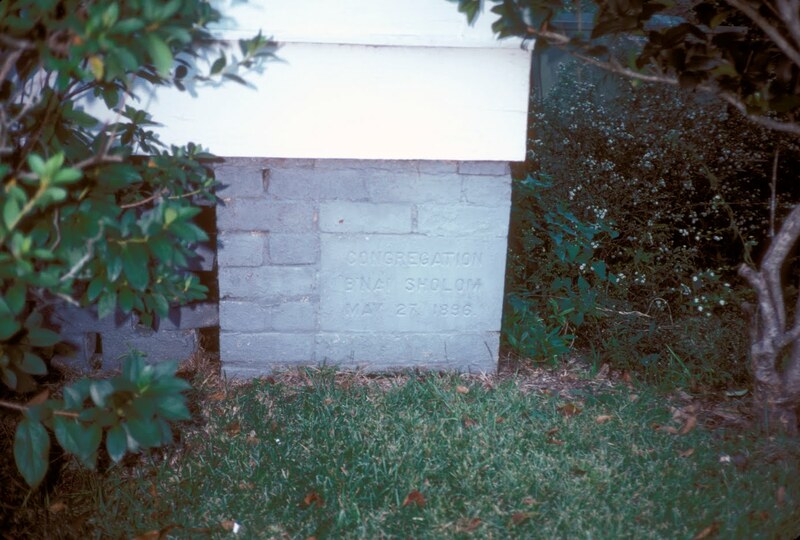 For a full list of surveyed cemeteries and information on contributing to cemetery care and repair see the Foundation's website, which also reports monthly on news affecting Jewish cemeteries. Riga, Latvia. 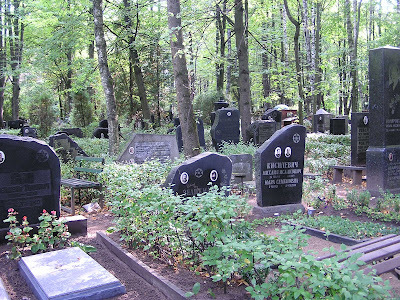 New Jewish Cemetery. Photo: Samuel Gruber 2004. 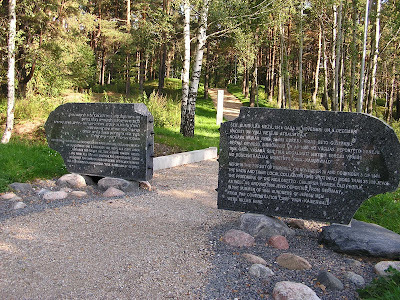 Arkady Suharenko, Chairman of the Latvian Council of Jewish Communities, wrote in the introduction to the report that "The majority of the mass graves remained unmarked for the entire Soviet period, and only in a few places, the local authorities erected memorial signs, although these did not specify that those murdered at these sites were Holocaust victims. Jewish life in Latvia revived from virtual non-existence in the late 1980’s, with the liberalisation of the political system of the USSR. Among the goals of re-established Jewish communities, one of the main ones was the preservation of Jewish heritage and memory. Over the last twenty years, extensive research has been undertaken and currently, most of the mass graves are surveyed and marked; the cemeteries have been surveyed, and at some sites, restoration work has been conducted. The participation of the Latvian Jewish community in the Lo Tishkach project was important for us both in evaluating the current state of Jewish burial places and in making an in-depth research of some of these sites, as well as in enabling the young generation of Latvian Jews to be in touch with their roots and the Jewish history of the region. We hope that this project will contribute to the development and advance of the Latvian Jewish community, providing a new dimension of understanding the importance of preserving our cultural and spiritual heritage." Riga, Latvia. New Jewish Cemetery. 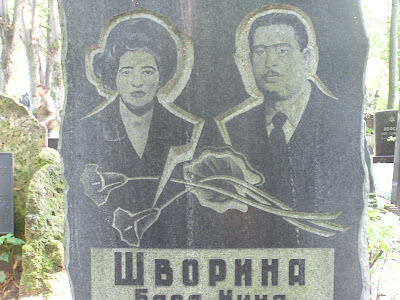 Detail of contemporary gravestone. Photo: Samuel Gruber 2004. Hamden, Connecticut. Congregation Mishkan Israel, Chapel. Fritz Nathan and Betram Bassuk, archs. Jean-Jacques Duval, stained glass artist. Ark design, unidentified. In 2009 I wrote an article for Tablet Magazine about Abstract Expressionist artist Adolph Gottlieb's stained glass windows in the Kingsway Jewish Center in Brooklyn (this article has just been republished, without slide show, in a special Shavuot synagogue issue of New York's Jewish Week). 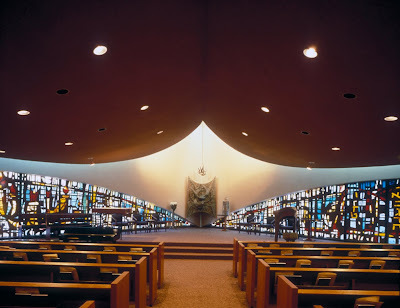 I was already long interested in synagogue stained glass, but Gottlieb's work made me more attentive to the innovative techniques, colors and symbols employed by synagogue stained glass artists in the 1950s and 1960s, the heydey of American abstract art. Gottieb was able to successfully transform the traditional Jewish use of a limited number of religious and cultural symbols to a larger abstract artistic aesthetic. Gottlieb's program also suggested a nearly-attainable grasp of archetypal highly charged symbols of both personal and cosmic significance, in the tradition of Jewish mysticism. Brooklyn, New York. Kingsway Jewish Center. Sanctuary window detail, designed by Adolp Gottieb. Photo: Samuel Gruber. I was therefore delighted when visiting Connecticut earlier this spring to encounter two exemplary stained glass programs by artist Jean-Jacques Duval (b. 1930) in synagogues I was visiting for their architecture. Both Congregation Mishkan Israel in Hamden and Congregation B'nai Jacob in Woodbridge were designed by Fritz Nathan and Bertram Bassuk (1918-1996), and both include chapels with stained glass by Duval, and Duval did the sanctuary work at B'nai Jacob, too. According to Duval, who remains active as a artist today with more 450 major commissions completed, he and fellow artist Robert Pinart were brought in by the architects for Mishkan Israel. These synagogues were truly international efforts. Nathan (1891-1960), who had been a prominent modernist in Germany before World War II and arrived in the United States as a refugee in 1940. Duval was born in Strasbourg, France in 1930 . After the War he studied at Ecole des Arts Decoratif in Strasbourg, and then in 1950, he accepted an offer to design stained glass in United States. In 1957 he opened his own studio in New York City. Pinart was born in Paris in 1926 and came to America in 1951. Both Duval and Pinart have achieved great success in their long careers). Today Duval lives and maintains Duval Design Studio in the Adirondack Mts. near Saranac, NY. 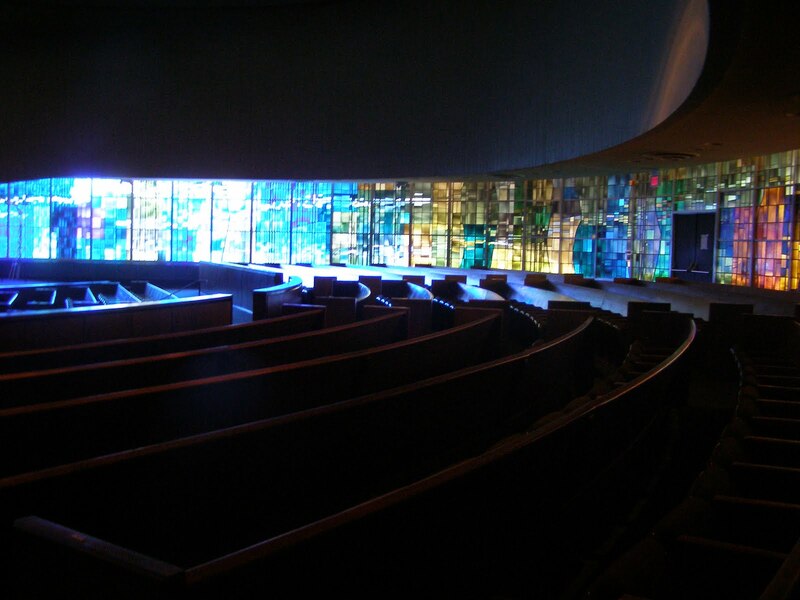 Pinart made windows for the Mishkan Israel sanctuary, and Duval for the chapel. 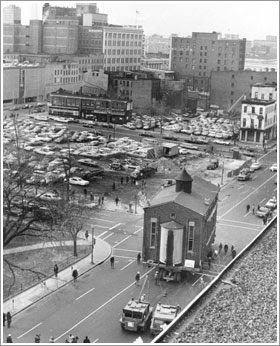 According to Mishkan Israel Rabbi Herbert Brockman, his predecessor Rabbi Robert E Goldburg disagreed with architect Nathan over the Ark design, and brought in artist Ben Shahn to create a more monumental arrangement (flanked by Pinart's ark-wall windows). When near-by Conservative Congregation B'nai Jacob adapted the recent Mishkan Israel design for their new suburban synagogue, Duval was engaged for all the stained glass work. 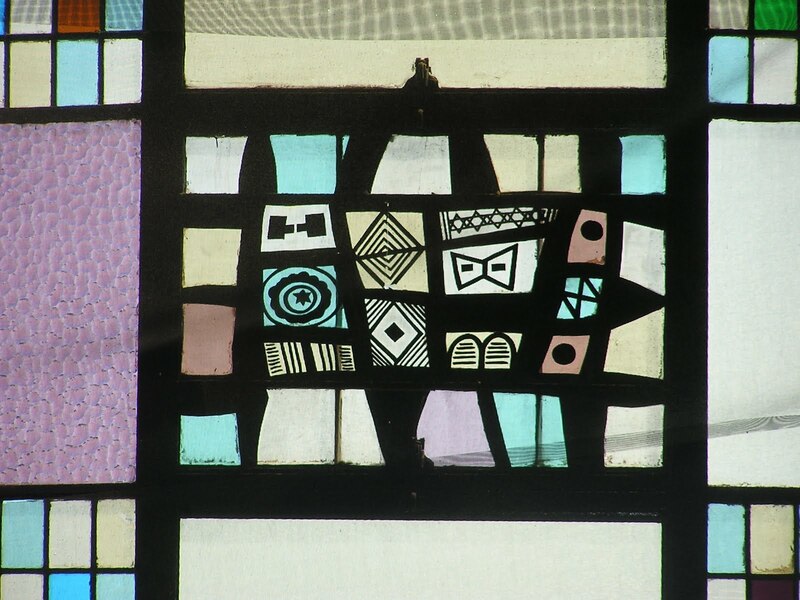 One of Duval's windows at Mishkan Israel has a similar feel to Gottlieb's - and it immediately drew my attention. 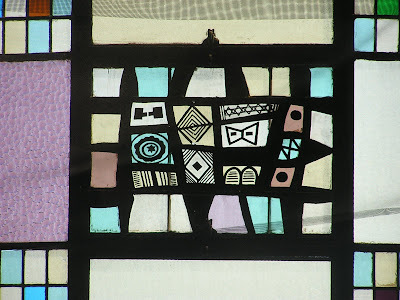 But Duval's fractured symbols are much more recognizable than Gottlieb's, (more akin to those Robert Motherwell used in his painted panel in Millburn, New Jersey), and firmly within the Jewish symbolic "canon." One reads the long strip window on one side of the Mishkan Israel chapel as a unrolled scroll, with each "sheet" illustrated by one symbol. There are tablets, a book, kiddish cups, etc. and a domed form that may be a tent, or a priest's hat, or something else (in fact, it look remarkably like the Beth Shalom synagogue designed by Percival Goodman in Miami). Duval's greatest success, however, in both chapels, was his ability to create full walls of stained glass that actually helped emphasize and strengthen the shape of the space instead of distracting from it. 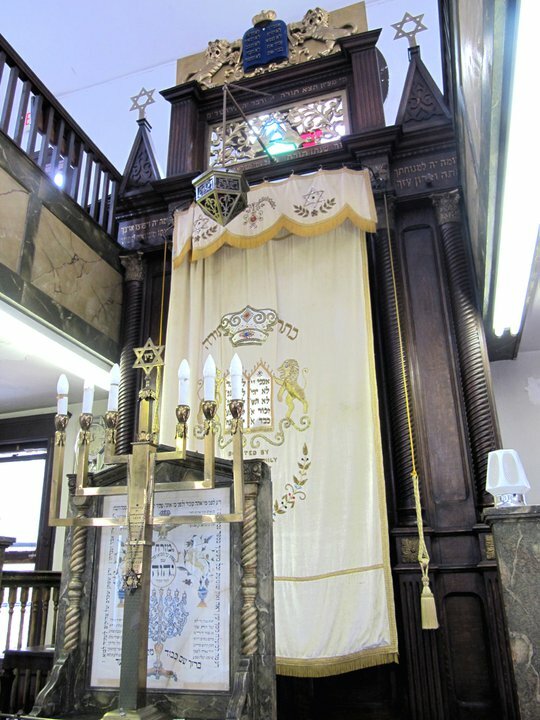 Duval has demonstrated this talent for making architectural walls that complemented the architecture design in many synagogue and church commissions. Most of his stained glass windows are not to be seen through, or even to be looked at as pictures. Rather, they enclose the viewer to create a container of worship space. Betram Bassuk, writing of Duval in Faith & Form the Interfaith The Journal on Religion, Art and Architecture said “I regard his empathy toward the architectural enclosure of which his work is to be an integral part, to be as fundamental a factor in his creative imagination as is his composing of its symbolic content.” At Mishkan Israel duval created a mosaic like affect of colored glass panels, roughly rectangular in shape, out of which appear across the entire composition - but only a certain angles - large nine-branched menorahs (see above). A similar effect is achieved over the Ark in the main sanctuary at Congregation B'nai Jacob (see above), though there the form of the seven-branch Temple Menorah is used. in the B'nai Jacob Chapel the use of symbols is more overt and I think, therefore, less successful artistically. Woodbridge, Connecticut. Congregation B'nai Jacob, Chapel. Fritz Nathan and Betram Bassuk, archs. Jean-Jacques Duval, stained glass artist. Woodbridge, Connecticut. Congregation B'nai Jacob, Sanctuary. Fritz Nathan and Betram Bassuk, archs. Jean-Jacques Duval, stained glass artist. Jean-Jacques Duval has provided me with a list of the synagogues for which he and his studio designed stained glass. Both Mr. Duval and I encourage readers familiar with these windows - or those who wish to discover them - to send us photos of heir current descriptions. In some cases synagogues have moved and buildings have been sold, and the fate of the Duval stained is unknown. Southfield, Michigan. (Former) Congr. B’nai David. Sidney Eisenshtat, arch. Jean-Jacque Duval stained glass artist. Photo: Samuel Gruber. El Paso, Texas. Temple Sinai, chapel. Sidney Eisenshtat, arch. Jean-Jacque Duval stained glass artist. Photo: Paul Rocheleau. The Jewish Telegraphic reports on the recent vandalism in Croatia. (JTA) -- Police are investigating an attack on the entrance to the historic synagogue in the Croatian city of Split, on the Adriatic coast. 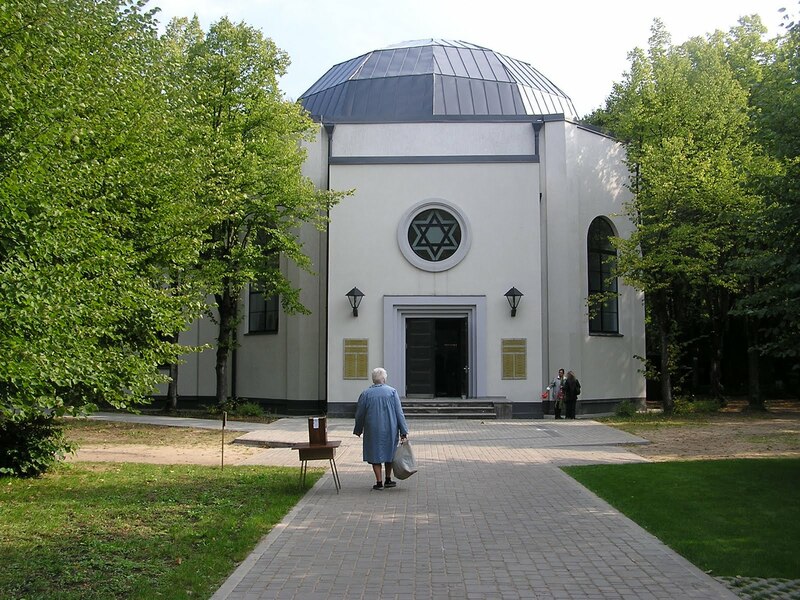 Unidentified persons covered the walls, doors and the information plaque around the entrance to the synagogue and Jewish community office with spray painted anti-Semitic and xenophobic graffiti including swastikas and slogans, during the night of May 29-30. Some of the slogans were directed toward political figures and the European Union, and scrawled 'signatures' included the supporters of the local soccer club Hajduk and an extreme right-wing radical Croatian party. A statement by the Jewish community released after the incident said the graffiti differed from other such instances in the city by "the larger quantity of graffiti and hatred emanating from them." "Good will, ability and efficiency of the relevant authorities to find the vandals as promptly as possible and punish them appropriately with educational effects will provide an insight in how much such incidents represent acts of an individual, and how much they reflect a more general attitude of the society," the statement added.